The moment that pollutants in soils become dissolved in natural waters, their potential for transport is greatly magnified, as is the likelihood that people will ingest them. The primary health risk from many hazardous waste sites, dumps, septic tanks, factory outflows, and other pollution sources is the possibility that pollutants will be dissolved into groundwaters or surface waters, then ultimately reach drinking water. Pollutants of concern include industrial solvents such as perchlorethlyene (PCE); trichlorethylene (TCE); motor fuel components such as benzene, toluene, ethylbenzene, and xylene, (collectively termed BTEX); and inorganic contaminants such as lead, chromate, arsenic, and nitrate. Just as each contaminant tends to affect specific organs in the human body depending on its chemistry, the behavior of contaminants in groundwaters and surface waters likewise varies from contaminant to contaminant. Rarely do chemicals behave identically in natural waters; typically there is at least one natural reaction that causes the bioavailability of a given contaminant to decrease, or attenuate, over time. These attenuation reactions include the following. Biodegradation: the breakdown of contaminants by soil microorganisms to less toxic or nontoxic compounds. Sorption: the "sticking" of contaminant molecules to solid surfaces such as minerals and soil organic material. Contaminants that sorb to soil solids are typically unavailable for human uptake unless the soil particle itself is ingested. Chemical transformation: the formation of contaminant-containing solids, which causes a decrease in the concentration of the contaminant in water that ultimately may be ingested. Chemical transformation also includes radioactive decay of unstable isotopes . Contaminant attenuation can be split into two components. Physical attenuation: the dilution and dispersion of contaminant concentrations in surface waters or groundwaters. Over time, dilution and dispersion tend to "smear out" contaminant plumes , causing a net decrease in contaminant levels at any one location. Physical attenuation tends to depend upon the velocity of the particular water (e.g., a fastmoving stream versus a slow-moving river) and its rate of mixing. Chemical attenuation: the collective assemblage of reactions that causes contaminant concentrations to decrease in surface waters or groundwaters. Chemical attenuation is rather complicated, and specific to the particular contaminant class. Organic contaminants are made up of electron-rich molecules containing linked carbon atoms. Soil microorganisms can derive energy by using oxygen, sulfate, nitrate, or ferrous iron to oxidize and break these chains down into carbon dioxide plus water. Often this breakdown is more rapid than engineered remediation. Rapid microbial attenuation is often observed for fuel hydrocarbons such as are found beneath leaking underground fuel tanks. Attenuation tends to be most rapid under oxidizing ( aerobic ) conditions that often prevail in loose soils. In oxygen-poor ( anaerobic ) waters, attenuation tends to be slower. PCE and TCE are two of the most common contaminants at hazardous waste sites. They are quite toxic and also tend to resist chemical attenuation. Microorganisms are only able to rapidly attenuate them by first reducing them under anaerobic conditions, and then oxidizing them under aerobic conditions. Obviously the potential for PCE or TCE attenuation hinges upon the chemical condition of the aquifer or soil. Chemical attenuation of inorganic contaminants such as lead, chromate, nitrate, and arsenic often involves sorption onto mineral surfaces. Microorganisms generally cannot break down such contaminants into less toxic compounds except in a few cases. Most notably, microorganisms are able to reduce oxidized (and toxic) chromate to insoluble and less toxic trivalent chromium. Likewise, microorganisms can convert nitrate to ammonia and/or nitrogen gas. Most other inorganic contaminants must be sorbed to mineral surfaces to be attenuated. Hazardous waste sites require remediation to contain and prevent the further spread of toxic chemicals into the environment. Following removal of the contaminant source, natural attenuation and bioremediation are two components of cleanup strategies. particularly true for such industrial metals as lead, cadmium, zinc, and nickel. It is also true for such important radionuclides that are present in radioactive waste as 90 Sr, 137 Cs, and isotopes of Pu (plutonium) and U (uranium). Chromate and arsenate sorb appreciably to many soil minerals despite the overall negative charge of both partners. Inorganic contaminants that initially sorb onto mineral surfaces from a contaminant-rich solution might in theory "desorb" back into contaminantpoor waters recharging a contaminated aquifer after the contaminant source has been removed. In fact, numerous field observations suggest that many sorbed contaminants become permanently sequestered after prolonged interaction with mineral surfaces. In other words, sorbed contaminants are taken up into mineral lattices (structures) where they are no longer bioavailable. Mineral uptake also makes the complete engineered removal of contaminants from soils and aquifers nearly impossible. In effect, the crystal lattices must be destroyed to remove the bound contaminants. Pollutant attenuation is most commonly taken advantage of in the treatment of sewage; that is, oxidation of organic matter is hastened by mixing on-site or by discharging into surface waters that have sufficient capacity to rapidly attenuate the imposed pollutant load. Increasingly, pollutant attenuation, or equivalently "monitored natural attenuation" or MNA, is being used as a component of hazardous waste site cleanups. Specifically, MNA is relied upon to remove contaminants from groundwaters, in parallel to and, after active remediation has ceased. 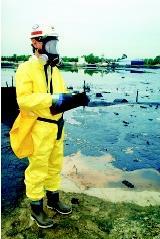 Bioremediation of contaminated sites typically involves the engineered acceleration of natural organic activity that leads to the breakdown of organic contaminants—most commonly spilled fuels and solvents—ultimately to carbon dioxide. Less common is the introduction of new organisms, themselves, to contaminated sites. Natural soil organic activity tends to be sufficiently pervasive that, given the appropriate nutrients, breakdown of contaminants can be achieved by native populations of microorganisms. Nutrient additions may include oxygen, a carbon substrate such as molasses, and/or hydrogen. It must be noted that not all contaminants attenuate rapidly enough to prevent potential impacts on human health. Instead, knowledge of attenuation rates and capacities is critical to the successful implementation of pollutant attenuation in either realm. Each area remains the subject of intense investigation by chemists, biologists, geochemists, engineers, and other scientists. SEE ALSO Fresh Water, Natural Composition of ; Fresh Water, Physics and Chemistry of ; Groundwater ; Modeling Groundwater Flow and Transport ; Modeling Stream Flow and Quality ; Pollution of Groundwater ; Pollution of Lakes and Streams ; Radioactive Chemicals ; Septic System Impacts ; Wastewater Treatment and Management . Brady, Patrick V., Michael V. Brady, and David J. Borns. Natural Attenuation: CERCLA, RBCAs, and the Future of Environmental Remediation. Boca Raton, FL: Lewis Publishers, 1997. Rice, David W. et al. "Recommendations to Improve the Cleanup Process for California's Leaking Underground Fuel Tanks." In Lawrence Livermore National Laboratory Report. Lawrence Livermore National Laboratory, CA: 1995.